Pest description and damage This adelgid feeds on the bark of pines and spruce. 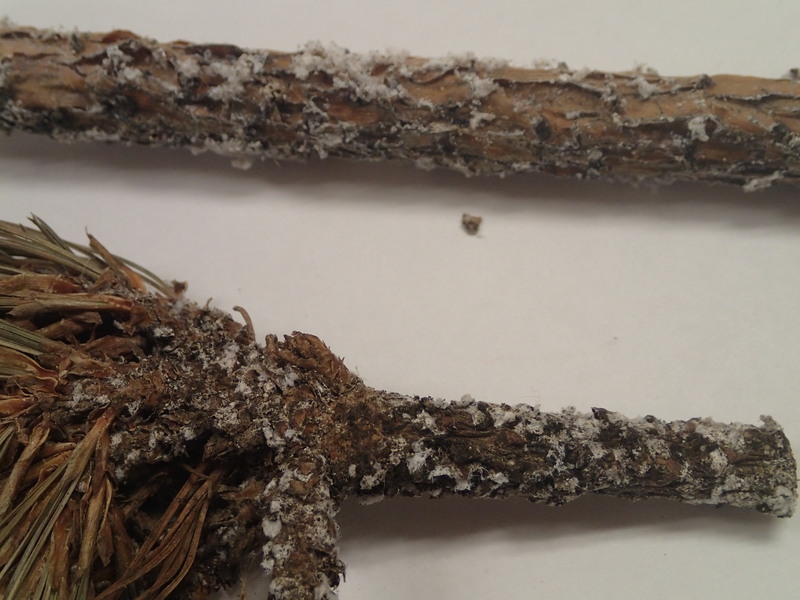 They appear woolly and may be confused with woolly aphid species. Pine bark adelgids form woolly or cottony white masses on the trunk, branches, or twigs. The adelgids are black and short-legged under the white material. Heavy infestations can look like snow on the trunks of trees. Seedling and young trees may have adelgids at the base of the needles or on shoots instead of on the trunks. Needles often become somewhat yellowish (chlorotic). Severe adelgid infestations can result in stunting or death of trees. Biology and life history The insect overwinters in an immature state on the tree. As the weather warms, they secrete waxy material over their bodies in woolly tufts. Small clusters of eggs are laid in the tufts in early spring. Crawlers emerge and move to other parts of the tree or are blown or carried to other hosts. Pest monitoring Begin observing shoots prior to budbreak, looking for white cottony insects on the bark of the trunk or undersides of branches. Confirm by checking leaves. Check for presence of natural enemies. Encourage natural predators including lady beetles and lacewings. Check colonies to determine if there are live adelgids or crawlers. Hand-wipe or use a stiff brush to control small infestations where possible. Wash adelgids from trunks and foliage with a strong stream of water. Where practical, remove and destroy heavily infested branches and trees.